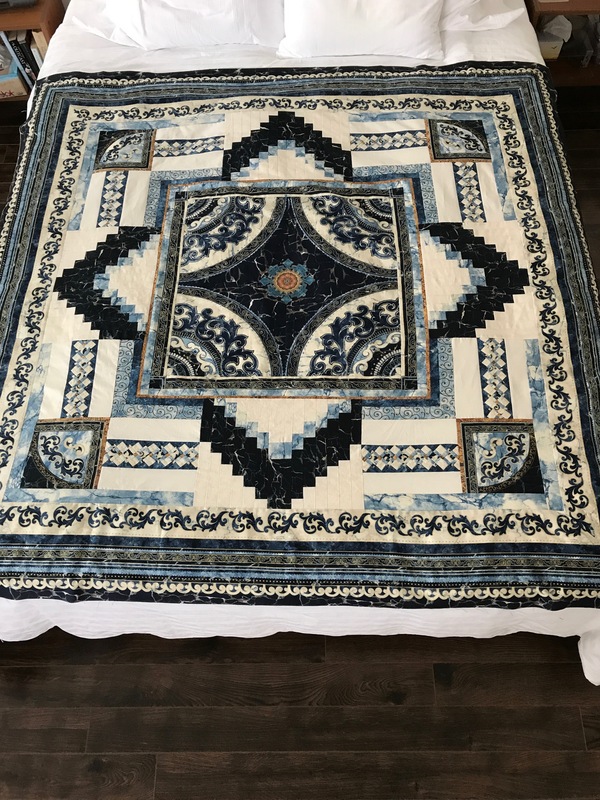 Medallion Quilt – Top Done! I adjusted the final corner within the block so that it was better balanced without affecting the outer dimensions. Then I added the outer border, complete with mitred corners. Quilt still square, Yeah! I’ve intended the quilt to be a lap quilt. However, while the finished size (63″ x 63″) is not a full double/queen size it could certainly be used as a colourful spread to focus attention on a bed. Now I have to think about the back of the quilt. I have a complementary fabric double width so I could just cut the size I need and be done with it, but before I do that I will go through the scraps and other leftover fabric to see if there is some kind of strip I can cobble together to add interest to the back of the quilt. But that’s for another day – likely tomorrow. Melanie McNeil asked if I was pleased with my efforts – now I can definitely say I am. Here is a wonderful medallion quilt for you to enjoy. Also look at her right-hand margin for links to recent posts, which will show you the progression from start to finish. I’ve loved watching this process and hope you will take a look, too.